The Professional Workflow HR2 4-Bay Thunderbolt 2/USB 3.0 Hub from Lexar is a 4-bay hub that supports Lexar's Professional Workflow line of USB 3.0 storage drives and Thunderbolt 2/USB 3.0 card readers. You can connect this hub using either Thunderbolt 2 or USB 3.0. You can also add up to four flash-based storage drives to this hub and store transferred files. Even if you connect it to the computer with Thunderbolt 2, the drives and readers will still operate at USB 3.0 speed. However, because Thunderbolt 2 supports a faster overall speed, you can use all four devices in the bay at the same time, without slowing down. The hub is also backwards compatible with Thunderbolt and USB 2.0 (at slower speeds), while using the same cables and connectors. Note: The readers and drives are sold separately. This Professional Workflow HR2 is a 4-bay reader and storage drive hub that connects to a computer via Thunderbolt 2 or USB 3.0. Separately sold USB 3.0 card readers support SDHCTM/SDXCTM UHS-I, CompactFlash UDMA 7, XQDTM, and CFast 2.0 (USB 3.0 or Thunderbolt 2) formats, while separately sold USB 3.0 flash-based storage drives offer 256GB and 512GB capacities. For added versatility, you can remove the readers and storage drives from the hub for individual use on the go. This Professional Workflow HR2 hub leverages USB 3.0 technology for high-speed performance and is also designed to deliver Thunderbolt 2 speeds. The Thunderbolt 2 technology gives photographers and videographers the ability to transfer 4K video and other large media files, at up to twice the speed of Thunderbolt and up to four times the speed of USB 3.0 devices. It is also backwards compatible with Thunderbolt and USB 2.0 (at slower speeds), when you use the same cables and connectors. You can add up to four flash-based storage drives to this hub and store transferred files. Simply plug the readers or storage drives into the hub and start transferring and archiving files. In addition, the Professional Workflow HR2 hub provides two Thunderbolt 2 ports and one USB 3.0 port, making it easy to daisy-chain with your existing setup. The two Thunderbolt 2 ports allow you to place the hub anywhere in your lineup of other Thunderbolt devices to create a customizable setup. The hub helps you to eliminate cable clutter and take control of the workflow. Box Dimensions (LxWxH) 11.339 x 8.268 x 3.543"
Professional Workflow HR2 4-Bay Thunderbolt 2/USB 3.0 Hub is rated 3.4 out of 5 by 22. Rated 1 out of 5 by Stephen from DOA. Cheaply Built. It's a nice concept, I was excited about being able to offload four cards at the same time. I don't know why I never thought about just getting a bunch of readers and a Thunderbolt 2 dock - but that is the way to go. This thing arrived DOA, one of the bays did not function (and yes, tried multiple readers/cards which all worked in the other bays). You can instantly tell it's cheaply built, the power supply looks sketchy, and has no on/off switch as mentioned by other reviewers. Try harder Lexar, it's a great idea.? I've since ordered an OWC Thunderbolt 2 dock (which has five USB3 ports). More cables but at least I know it's built with care. Rated 1 out of 5 by Victorboyko from Great idea, but the overheating just kills it You will not believe how hot the cards get when the thing is working. We have 2CF 1XQD and 1SD and when you just leave the cards in the reader for 5-10 minutes while working with other cards they get so hot that they just might be fried! Very frustrating. I would stay away from using this product ESPECIALLY at a big event, when you need to transfer images from a lot of cards at the same time (say, big event with 3-4 photographers). Possible loss of data because of overheating may cost thousands.. Plus reputation risks. No way. Rated 3 out of 5 by Orange from Great Performance, Annoyingly Flawed The speed of this hub is great, as is the modular system. However. It has no power switch. It has no automatic power down, and Lexar support recommends it's turned off when not in use. This is more annoying that you may think when you have to remember to unplug and re-plug the thing every time - particularly if attached to a workstation. Poor design, given that it's intended to be powered down (per Lexar themselves). Keep this in mind before ordering it. Rated 5 out of 5 by Colleen from Where has this been all this time? When I shoot sports I use several cameras during the game, resulting in having at least three cards to load afterwards. This hub allows me to load four different cards at a time. This particular unit is a Thunderbolt hub, meaning that it is FAST. This item is just the hub, with no card readers. You have to buy card readers in the Professional Workflow series, to fit the cards you use. At the moment I use XQD cards, and so have three XQD readers plus one CF reader for my Nikon D4. I can load all four cards at one time using PhotoMechanic. You are bound only by the write speed of your hard drive, Where has this been? Just love it. Rated 1 out of 5 by action-camera.nl from WATCH OUT! SYSTEM OVERHEATS THE CARDS. We used this product for our data challenges. we needed 24 microSD cards, so the 12 slots being offered was quite handy. ... so we thought. Because the rapid transfer rates, the cards tend to overheat. Resulting in extensive data loss from our gopro's, which recognised the cards, but failed to write to file (when finalising the file on card) Please do not buy this product if you are looking for MICROSD card transfer. Rated 2 out of 5 by Besus Weasley from Works fine, but lots of issues... I had high hopes for this thing, and it does work (the thunderbolt transfer times are noticibly higher than USB 3.0). But I can't recommend it because the problems with it far outnumber the benefits. First, yes, this thing gets HOT. As in, if you held some fingers on the hottest parts of it you'd seriously get burned. It's crazy. It also doesn't have an on/off switch which is a huge pain. How can you keep it cooled down? You have to unplug the power cable from the rear of the hub after each use, then plug it back in again. Ridiculous. I purchased a CF, a micro SD, and 2 SD readers for this hub. Come to find out there IS a solution to help with the overheating. You need to leave the BOTTOM slot open and DO NOT use it. For whatever reason, the bottom slot gets hotter than any others. It was so hot I thought it would melt my micro SD cards, and they were almost too hot to hold after removing them. By leaving the bottom slot open and unplugging the hub after each use, I've been able to make this thing work. But what a waste. I've got a spare SD card reader now, and have to jump through hoops whenever importing card media. Stay away from this thing if you plan on using it extensively. You're better off with a USB 3.0 hub and a couple card readers. It won't look as nice, but it'll work a whole lot better. Rated 3 out of 5 by Brandon from Makes for a nice thunderbolt hub. It's like a thunderbolt hub really. It's annoying that it doesn't have a power switch. After I eject the drives the bay stays lit. I end up unplugging the thunderbolt from the computer then unpluging the power cable on the bay. Annoying. With about that much trouble it's tempting to just plug in the two drives directly to your computer though you wouldn't have the thunderbolt speeds perhaps. That said, my experience with the drives themselves has been good. This makes for a tidy and contained way to manage a bunch of these SSD's. Transcoding/Editing raw MLV 1080p video with these and they do pretty well. 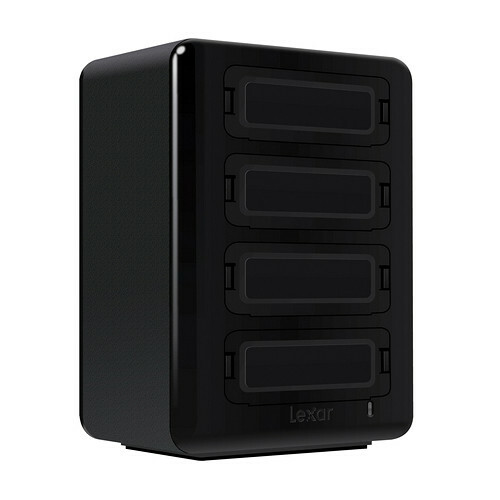 Rated 5 out of 5 by photosteve from Lexar Professional 4-bay is worth it I use this Thunderbolt 2 hub to download multiple cards at once, and to do it very fast. Thunderbolt is faster than USB3, and with the speed increase for downloads it allows me to get images in and uploaded much quicker. I also have the CF card and SD card modules plugged into it, and as far as I can tell the speed of the CF module is faster than the built in reader in my MacBook Pro. I have Thunderbolt,not Thunderbolt 2.I have a USB 3.0 card reader.Will this work,and at what speeds? Thunderbolt 2.0 is backwards compatible, and this reader will be compatible regardless since you have USB 3.0. The reader will operate at USB 3.0 speeds. Does the HR2 hub, connected via Thunderbolt cable to a mac, work with the CFR1 Compact Flash Reader? The CR2 CFast Reader specifically says it's Thunderbolt compatible but the CFR1 does not list Thunderbolt compatibility. You can use Thunderbolt with the CFR1 reader. Will you make a reader that holds both SD and CF in one? While there isn't a hub component that can read both at once, Lexar does make the Professional USB 3.0 Dual Slot Reader, which is UDMA 7 compatible. Can you use the lexar thunderbolt card readers in this? It doesn't look like it, but its a pity if you couldn't. Can you only use leader card readers that use usb3.. The Lexar bay is thunderbolt and if you are asking about the Lexar Workflow CR2 Thunderbolt 2 CFast 2.0 Reader than yes it does work in this hub. Does anyone know what the DC power requirements are for this device? Eg. 12V 3A? I bought this unit but I needed many more moving parts to make it work. So really I havent used it. does power supply supports 220v? Yes, OK for 100-240v. But you may need your own power cord to go between the power supply and the power point. Std 3 pin US cord supplied. The Lexar Professional Workflow HR2 4-Bay is essentially a hub. You need to attach it to a computer and you can upload the images from your cards in to the computers hard-drive or the storage drives in the hub and you can pick what drive you want to do that to. But again it is manual and the computer is the interface. If i buy the HR2 and four of the Professional Workflow SR2 (SDHC/SDXC UHS-II USB 3.0) readers, will the transfer speeds be Thunderbolt when the readers are installed in the bay or will the bay operate as USB 3.0? Thank you. USB 3.0 speed is up to 480 mb per sec. If you use SD cards, the fastest speed is 30 mb per sec. If you use XQD cards, the fastest speed is 400 mb per sec. Both are less than the USB speed, so the card sets the transfer rate. The only reason to use Thunderbolt over USB 3.0 is if your Mac doesn't have USB 3.0.